Youth Wrestling in Oklahoma is not limited to club practices. Each wrestler has the option of signing up for weekly tournaments. Tournaments are a great way for your child to use what they have learned in practice and also receive tips from the coaches on what they need to work on. 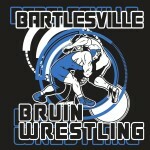 BWC looks at www.okwa.us and USA Wrestling for different tournaments to attend. Each week we will attend a tournament. Sometimes novice and open tournaments will be at different locations. The tournaments BWC will go to are determined as much as in advance as possible (some times new ones pop up with only a week or two notice). If you decide to attend a tournament, you will sign up your wrestler on Tuesday night at practice. You will sign your child up according to age division, weight and novice/open. Most tournaments are $15-$16, however, some of the larger end of the season tournaments may run $25-$40. You will be provided with a flier that tells the location and weigh in times for your wrestler. BWC would like all wrestlers to sit together at the tournaments (it makes it easier for the coaches to keep track of kids). Tournaments hosted through the OKWA will have brackets available to purchase for $1. This will tell you what mat your child wrestles on and what match numbers they will wrestle. BWC staff can help you navigate the brackets. USA Wrestling tournaments can be followed through www.trackwrestling.com . The brackets are usually posted a little bit before the tournament starts. Parents are responsible for getting their wrestlers to and from tournament, making sure they weigh in at the correct time, making sure they have the appropriate attire, water/snacks, exc. The BWC coaches will do as much as possible to help however needed, and of course will be on the mat with your wrestler.